Flame-grilled burgers and more at this casual joint. Flame-grilled burgers are Food Camp’s forte. Click for more. 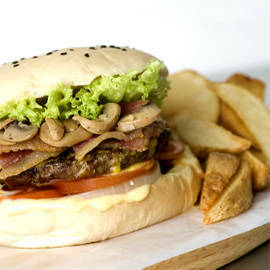 (SPOT.ph) What started out as merely a food stall in Banchetto, the old late-night market in the Ortigas Business District, is now a full-fledged casual dining spot that's quickly building a reputation for its juicy and tasty pure-beef burgers. It may look small and unassuming on the outside, but Food Camp dishes out burgers that are big on flavor and size. The menu cleverly features only five burgers (making ordering so much easier! ), aptly named Alpha, Bravo, Charlie, Delta, and simply, Wagyu. Non-adventurous eaters will appreciate the Alpha, a classic cheeseburger, while the jalapeño-topped Delta and mozzarella-stuffed Charlie burgers won't disappoint foodies craving for an interesting and delicious flavor. 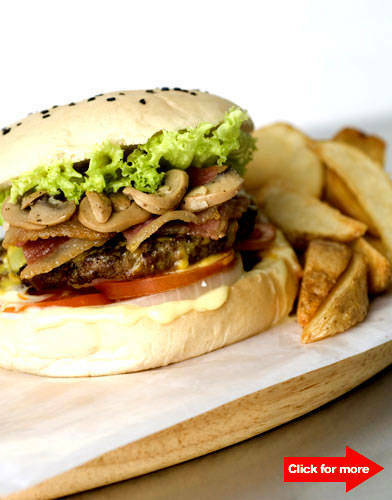 Serious meat-eaters should definitely go for the Bravo burger that's topped with cheese, mushrooms, and bacon, and served with skin-on potato wedges, or the bestselling Wagyu burger, whose aroma alone is enough to make you salivate. Take your burger a notch higher by adding gourmet cheeses like Gruyere, Manchego, Gorgonzola, Cheddar, or Provolone, and by going all-out and ordering a double patty. Non-burger fanatics are in for a treat, as well. Food camp has a killer Philly Cheese Steak (P99) that's up to par with those served at high-end steak spots and a huge serving of nachos generously loaded with toppings. The jalapeño sticks, mozzarella bombs, and skin-on potato wedges all make wonderful sides. Oh, and don't forget to save room for the smooth and creamy milkshakes Food Camp is also known for.